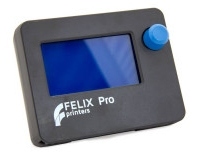 The FELIX pro has a ballscrew with very low friction to ensure accurate z-axis movement. This in some cases especially with a heavy object can cause the z-axis to move down by itself at a low speed. 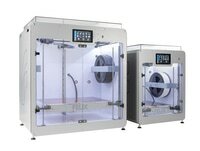 When you have this behavior there is nothing wrong with the printer, in fact you have an extremely efficient and straight z-axis spindle. In some cases this can be perceived as unwanted. To fix this an option would be to use thick ball bearing grease, to increase friction a little bit.